It sometimes seems the games industry churns out JRPGs quicker than you can say "androgynous teenage hero with spiky hair". 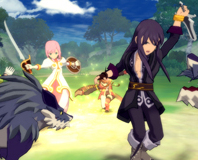 There are jewels hidden amongst the emo haircuts and world-threatening disasters though and Tales of Vesperia is a JRPG that stands out from the crowd. Wide open areas, dynamic weather and lighting, epic fantasy and a classic role-play structure - could The Witcher be the next must have CRPG or is it cursed to be just another mediocre title or worse? There's only one way to find out and that's to read the review! The goovie, or gaming-movie, has for a long time been the subject of ridicule in the world of the film critic. We felt the need to ask the question: Can movies and games ever mix? We take a look at the history of games and movies and see whether they can ever work together. Riding on the wave of the massive sales of Gears of War, Mark Rein has said the series could go beyond a mere trilogy. Mario, GTA and Final Fantasy - watch out. Square Enix has repeatedly denied the existence of a sequel to Final Fantasy XI. However, a report has turned up on a respected gaming site suggesting otherwise.